In September of 2010 a collaboration of North County Artist toured three senior living facilities and performed Broadway tunes for a combination of "Active Retired Seniors", seniors in "Assisted Living Care" facilities and convalescent patients. The deep impact the event had on the performers proved to be as significant as the effect the performance provided for the audience. Arts Off Boadway's Ambassadors Club is in training for the continuance of this benevolent mission. 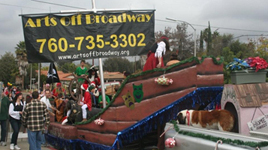 Escondido – Arts Off Broadway’s Community and Youth Theatre took first place for their civic float in the 57th Annual Escondido Jaycees Christmas Parade. 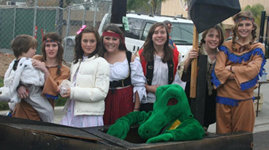 The float decorated as a “Pirate Ship” had over 40 participants dressed up in characters from the fairy tale Peter Pan that included Hook, Smee, Tiger Lilly, Wendy, John, Michael, Peter Pan, the crocodile and even Nana (a real Saint Bernard). 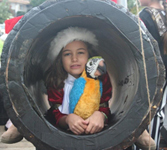 When Arts Off Broadway heard that this year’s Escondido Jaycees Christmas Parade theme was A Fairy Tale Christmas, we could not wait to participate. 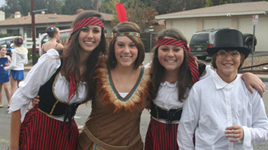 “This was a great opportunity for youth and adults in our community to have fun dressing up and riding on the float. It was so much fun to hear the little kids call out for the characters on the float and we are looking forward to participating in the parade next year. 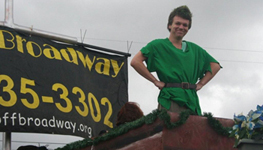 Partaking on the float has really gotten the kids and adults excited about our upcoming auditions for Peter Pan in February 2009”, states Marie Verger. Escondido - based Arts Off Broadway youth theater recently partnered with Heart for Africa to take a group of approximately 30 students and parents to Swaziland, South Africa, as volunteers at the El Shaddai Orphanage. The students participated in an art exchange and taught the children in the village the musical production of 'Joseph and the Amazing Technicolor Dreamcoat.' 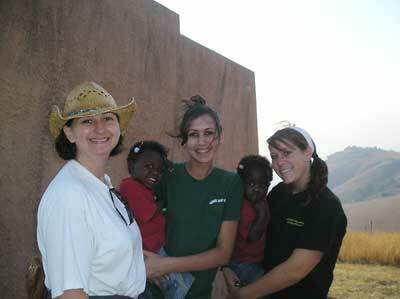 In return, the students learned Swazi songs that were performed for the community. The students also helped plant 34 gardens, built onto the orphanage's dormitories, helped where needed in the surrounding community and helped distribute 30,000 pairs of new shoes donated by Soles for Souls. For information, call (760) 445-7217. Photo: From left are AOB President Marie Verger and AOB students Sadie Verger and Amanda Mune, both holding children from the orphanage.